Colin Kaepernick has not played in the NFL for over a year and is still making the news. Kap is the face of the new ad campaign for Nike and still has players supporting his movement as they kneel during the National Anthem. 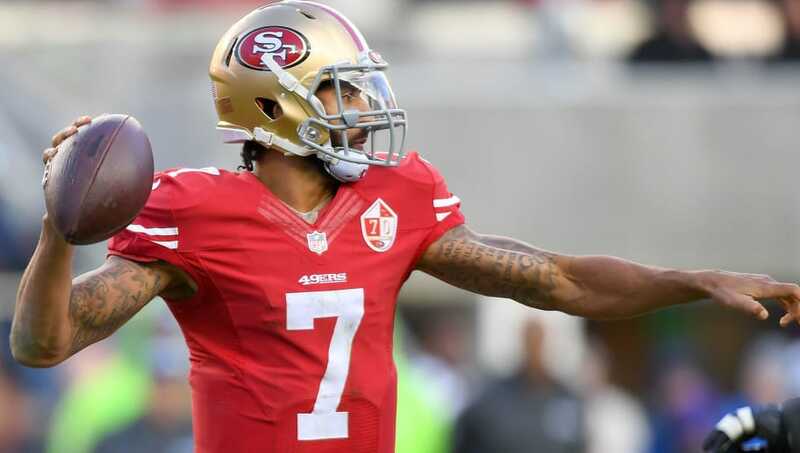 Kaepernick's remained unemployed throughout this difficult process, but now could find himself back on the gridiron thanks to the interest of two teams. Kaepernick's attorney Mark Geragos hinted that the New England Patriots and Oakland Raiders are interested in the free agent QB. Take this with a grain of salt, as this is the same man that said he'd be signed last year. Still, things are a bit different now. Geragos hinted at these two teams by saying "if Al Davis were alive" and referencing Meek Mill's mutual friendship with both Robert Kraft and Kaepernick, so it's not like these clues are gospel. Geragos, did say there would be news next week, so even if he led everyone on a wild goose chase, teams are kicking the tires on the former NFC champion. It would make sense for these two teams to pick up on Kap. Despite Jon Gruden's misinformed comments about Kaepernick, he'd still be a solid insurance option behind the turnover-prone Derek Carr. As for New England, the team already knows Tom Brady supports him. If TB12 gives him his coveted stamp of approval, fans might not be as hesitant to jump on board the bandwagon.